The theme for this year’s show remains a “closely guarded secret”. Ryan is speeding towards this year's show. IT’S ONLY 60 days to Christmas (! ), and RTÉ has announced that applications are now open for tickets for its Yuletide-themed edition of the Late Late Show. 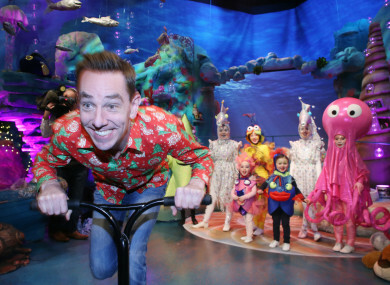 This year’s Late Late Toy Show will be broadcast on Friday 30 November, and the applications open after the regional auditions for the show came to a close this week. There were more than 140,000 applications to be an audience member for last year’s show, and RTÉ are expected similar numbers this around. The theme for this year’s show remains a “closely guarded secret” but host Ryan Tubridy is certainly excited. “I want to wish everyone the very best of luck, and who knows, I could be seeing you on 30 November for the most magical night of the year,” he said. Applications for this special edition of the RTÉ programme are run differently to its normal edition. Only applications made through the main website will be eligible to be entered into the draw. Tickets are issued via a random lottery and successful applicants will be notified closer to the broadcast. Auditions were held earlier this week for those hoping to perform on the show in Limerick, Tullamore and Dublin. Last year’s show – which was Little Mermaid-themed – had an average audience of almost 1.35 million people, with 72% of the audience share. Email “Applications now open for tickets to the Late Late Toy Show”. Feedback on “Applications now open for tickets to the Late Late Toy Show”.